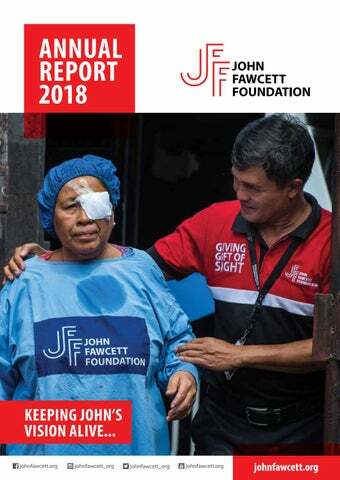 WHO WE ARE The John Fawcett Foundation (JFF) is a humanitarian not-for-profit organisation that assists needy people in Indonesia, with its main focus on sight restoration and blindness prevention. JFF Is registered in Australia, Indonesia, the United Kingdom and the USA. WHAT WE DO JFF offers its assistance to people in the lower socio-economic group free of charge and without religious, political or ethnic consideration. The Foundationâ&#x20AC;&#x2122;s headquarters are in Bali, Indonesia, and its humanitarian projects include Sight Restoration and Blindness Prevention, Childrenâ&#x20AC;&#x2122;s Corrective Surgery, Prosthetic Eyes and Technology Transfer. WHERE WE WORK While JFF is based in Bali, its humanitarian work also extends to other Indonesian islands where people are impoverished and medical specialist services are scarce. A critically important member of our Foundation is International Coordinator, Penny Lane, who acts as liaison between the Australian and Indonesian arms of the organisation. Penny’s long association with the Foundation and her knowledge of the Indonesian people and their language is invaluable. the Foundation’s work, including meeting statutory requirements, financial recordings, acquisition of medical equipment and a multitude of other tasks to ensure that the team in Bali can carry out their work and that we are fully compliant with Government requirements. The Foundation Board’s last meeting for the year is held in Bali. Board members who are able to do so travel to Bali and, following the meeting, enjoy a convivial afternoon with the Bali staff and other guests. The 2019 meeting is scheduled for 27 September, and friends of JFF who happen to be in Bali that day are welcome to join our group for lunch. We would not have a humanitarian foundation without the generous support of our donors. The regular receipt of funds enables us to carry out our chosen work. You really are a wonderful group of people. On behalf of our many patients I say THANK YOU, THANK YOU, THANK YOU. The output of the Bali team, under the leadership of Gede Bingin, is very high. Those who have enjoyed a visit to our Bali headquarters will probably attest to the warm and friendly greeting received from the Bali staff. Visitors are always welcome. Whilst all people mentioned above are vitally important to our Foundation, the people that are the most important to us are our patients. Whether they be cataract blind, have only one eye or suffer from a facial deformity, they put their trust in us and in the ability of our Indonesian doctors, nurses and assistants to repair the damage. As John Fawcett frequently said “THEY ARE BLIND BECAUSE THEY ARE POOR AND THEY ARE POOR BECAUSE THEY ARE BLIND.” This extends to those with other afflictions as well. It is my earnest wish that we continue to assist our Indonesian neighbours and, with your continued support and assistance, we will achieve this ambition. et again, another great year for the John Fawcett Foundation as we continue providing services to our needy people in Indonesia. 2018 was a very successful year as we were able to help more people than in the previous year. I was grateful to see so many donors and supporters continue their generous assistance, and some took the initiative to organise fundraising events to support the Foundation’s work. This is really encouraging for those of us who are active in the field. A highlight of 2018 was a program in Merauke, West Papua, the far eastern part of Indonesia, where we conducted an eye screening and operating program in partnership with the Indonesian Air Force. Our team returned to Papua and, with LPMAK, travelled to very isolated villages accessible only by boat, providing a vital service for the local people who had never received any services of this kind before. For our team it was both a great challenge and an amazing experience. We acknowledge the risks of sending the team to the jungles of Papua, but on the other hand we were very glad that we were able to bring to realisation one of John’s dreams of the Foundation taking its services across the whole archipelago, which we have now done. “So we did it, John”. I am very happy with the results we achieved in 2018. We performed 4.5% more cataract operations compared to the previous year. This was due to our successful offshore program where so many of the cataract patients are found and to our dedicated team often working until very late in the evenings. In our Children’s Corrective Surgery Project we assisted patients from Flores and Sumba with operations to repair severe burns scarring, and also performed cleft lip and palate repair operations. Our Prosthetic Eye Program significantly increased its output with oculist Wayan Wijaya making and fitting more eyes than the previous year. We were also very fortunate to receive a very generous donation of tools from our very kind donors to support Wayan’s laboratory work. While 2018 was a great year we have to keep moving as there are so many underprivileged people who require our assistance. It is now estimated that 1.8% (4,600,000) of the Indonesian population is blind with cataracts. This means that, despite our efforts and good outcomes, we are contributing in only a small way to reduce incidence of cataract blind people. For us, to be able to provide assistance to the underprivileged people of Indonesia and reaching more people in need is dependent on financial support, and we express heartfelt thanks to all our supporters, donors and partners for their continued support of our work. I also thank the wonderful staff in Bali and special thanks to Penny Lane for her professional work. Sincere thanks also to the Board members of the John Fawcett Foundations in Australia, United Kingdom and Indonesia. Indonesia and over eight million visually impaired, the challenge is a big one. The social and economic costs of these large numbers are enormous, as well as the personal difficulties of the blind individuals and those who care for them. surgery to the blind in villages across Bali and other islands of Indonesia. blind are identified and operated on the same day in the mobile eye clinic. SCREENING SCHOOL CHILDREN FOR EYE PROBLEMS JFFâ&#x20AC;&#x2122;s team goes into village primary schools to check the eyesight of the students. The purpose is to detect eye problems early, treat them if possible and prevent them worsening. Glasses are issued to those who need them, and eye drops provided for those with infections. children and teachers about caring for the health of their eyes and avoiding accidents. and nurses. Patients are identified at a village eye screening and operated the same day. ADOPT A VILLAGE MOBILE EYE CLINIC – BALI JFF’s team ran 78 separate village programs in Bali, screening 23,486 village people with eye problems and operating 413 cataract blind. are distributed to around 60% and up to 10 cataract-blind people are operated in the mobile clinic. Many donors take the opportunity to visit and take part in the village eye screening and operating activities to see first-hand how their funds are spent. cataracts in these areas than in Bali where JFF’s Sight Restoration and Blindness Prevention Project has been active for 27 years. transporting our equipment and mobile clinic to remote parts of Indonesia to reach even more people in need. with cataracts received sightrestoring operations. Air Chief Marshal Yuyu Sutisna, Chief of Staff, Indonesian Air Force, visiting the JFF eye program in Tarakan, North Kalimantan, run in partnership with the Indonesian Air Force. West Papua, on the eastern border of Indonesia. In conjunction with the Indonesian Air Force the team conducted a mass screening over two days, and operated cataract blind patients to restore their sight. CHILDREN’S CATARACT SURGERY Six cataract-blind children were operated by Dr Wayan Gde Dharyata in the Puri Raharja Hospital, Denpasar. Two of the children were identified during one of JFF’s offshore programs. Children with cataracts undergo a general anaesthetic and are operated using Phacoemusification, a different technique than that used for adults in our mobile clinic program. For the first time for JFF, children with cataracts were operated in an offshore program – in Alor, Flores in January. Four children were identified in the screening and operated in the local hospital. Denpasar and surgeon, Dr Ketut Anom Ratmaya, and is also assisted by anaesthetists from the Bali Anaesthetistsâ&#x20AC;&#x2122; Association who provide their services free of charge. CLEFT OPERATIONS A total of 17 children and young people with cleft deformities were operated in this program in 2018.
and burns specialist Dr Mark Duncan-Smith. Thirteen patients with long-term severe scarring, most from eastern Indonesia, were operated in this program. JFF partners with the Kolewa Foundation to assist the burns patients. identified and assisted during JFFâ&#x20AC;&#x2122;s offshore programs. Each prosthetic eye is custommade by hand for the patients so that they look as natural as possible and move with the other eye, so much so that it is difficult to detect which is the artificial eye and which is the real eye. his Program was initiated in 1996 by John Fawcett and Mr Chris Brown, who was a teacher of Indonesian at Helena College, Perth at that time. The plan was to select two Balinese students who had just completed their secondary schooling in Bali and send them to Helena College for one term to experience life in Australia and to learn English and Computing, as well assisting in the Indonesian language and culture classes. Since 1996, 39 students have participated in this Program, returning to their island community enriched by the experience. Wayan Putri Antari and Gede Candra Kusuma were the fortunate students in 2018, and they returned to Bali in late December having benefitted by the new experiences of living and studying in Australia. medical specialists from Australia who travel to Bali at their own expense to pass on their skills and knowledge to the Indonesian medical personnel who work in our projects. team. Professor Crompton also joined the mobile eye clinic team in a village program to assess the JFF teamwork. inaugurated Visiting Professor after Professor John Crompton last year. His visit included the delivery of a lecture to the registrars, followed by a clinic at the hospital. diagnostic equipment, making recommendations for replacement or repair, and assisting with maintenance. David Yates, Ophthalmic Equipment Consultant The JFF team welcomed David Yates who gave a training session to upgrade the team’s accuracy of biometry measurements. David has conducted several training sessions over the years and we thank him for his valuable contribution. programs in East Java, with groups of students joining the JFF team to see firsthand the effects of their donations. fundraising activities for JFF, and we are very appreciative and grateful for this enthusiastic support. FUNDRAISING COCKTAIL PARTY Patricia Ryan (360 Degree Recruitment), who became aware of JFFâ&#x20AC;&#x2122;s work through a visit to one of our offshore programs with Reliable Education, organised a fundraising cocktail party in Perth in October. We thank Patricia, MC Carmen Braidwood and speaker Kim Hughes, the many businesses in Perth and Bali that donated items for auction on the night, and also the people who attended this event. email, and we sincerely thank all those who responded to these. and expenditure have been converted to Australian dollars. value in both monetary terms and in terms of establishing our Foundationâ&#x20AC;&#x2122;s financial credibility. effectively directed towards our projects â&#x20AC;&#x201C; providing free surgeries, glasses and eye drops for the poor. The John Fawcett Foundation is a registered incorporated association in Australia, ABN 81 338 697 784. 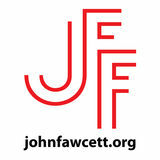 The John Fawcett Foundation (UK) is a registered charitable organisation in the United Kingdom, charity number 1115274. MAKE A BEQUEST As a non-profit organisation, The John Fawcett Foundation (JFF) relies on the generosity of its supporters to conduct its humanitarian work. More people than ever before support their favourite nonprofit organisations in their will. You can support The John Fawcett Foundation in this way by becoming one of our JFF Visionaries. This is a powerful and long-lasting way to make a difference and show your support. And it’s one that has no impact on your lifestyle today. Further information is available on our website, or contact our office at jff@johnfawcett.org. Make a donation and you’ll soon forget about it. But they’ll remember it for the rest of their lives.